Started as a off-off collaboration in 2017, the musical partnership between the French composer and electronic music producer and Bulgarian composer & instrumentalist Vassilena Serafimova is now being renewed, both live and in the studio. Following their first encounter, the duo decided to extend their collaboration. Vassilena Serafimova was trained at the Conservatoire de Paris, as well as the Juilliard School in New York, after completing her father’s percussion class in Bulgaria. The top-level musician has won some of the world’s most prestigious contests dedicated to her instrument, performing as a soloist and chamber musicians as part of various productions and festivals. The artistic co-director of the Marimba & Percussion Festival Bulgaria and of the Paris Percussion Group, she has also taken part in collaborations with musicians including jazz pianist Thomas Enhco (recording an album as a duo in 2016 for Deutsche Grammophon). The chemistry with self-taught Chloé was immediate, and fueled by the human complicity between the two musicians. “Chloé is my first collaboration with an electronic music personality, even though I have interpreted electroacoustic music pieces. But it’s never been as concrete as with her; that is totally new to me, a true field of exploration”. The music of Steve Reich, as the launchpad for the collaboration, was like a common language, which they gradually broke away from: “Reich is the most obvious link between electronic and academic music explains Chloé. “It was a starting point, a pretext, to go elsewhere. The idea was to then walk away from it… ». The duo was given the opportunity to develop their collaboration as part of a residency at contemporary artist Xavier Veilhan’s Studio Venezia (the French pavilion at the 2017 Venice Biennale), where they were assisted by Nigel Godrich (a producer who has worked with (Radiohead, Beck, U2, and Air). For six days, they recorded their productions while developing a one-hour live performance. “There are very few pre-recorded parts in this live performance,” says Chloé. “The principle was the construction of the pieces around organized and disorganized structures, because I was constantly sampling Vassilena’s live performance.” Their method of composing, working, finding new ways of operating is constantly evolving. The collaboration is no longer a temporary (albeit successful) episode: it becomes a common project. “It’s a collaboration that lifts me, helps me grows,” enthused Chloé. “Vassilena is quite open to experimentation, to make room for a partner who will shake up her more academic background. Also, she always has a lot of ideas and energy. Her way of playing is very inspiring”. 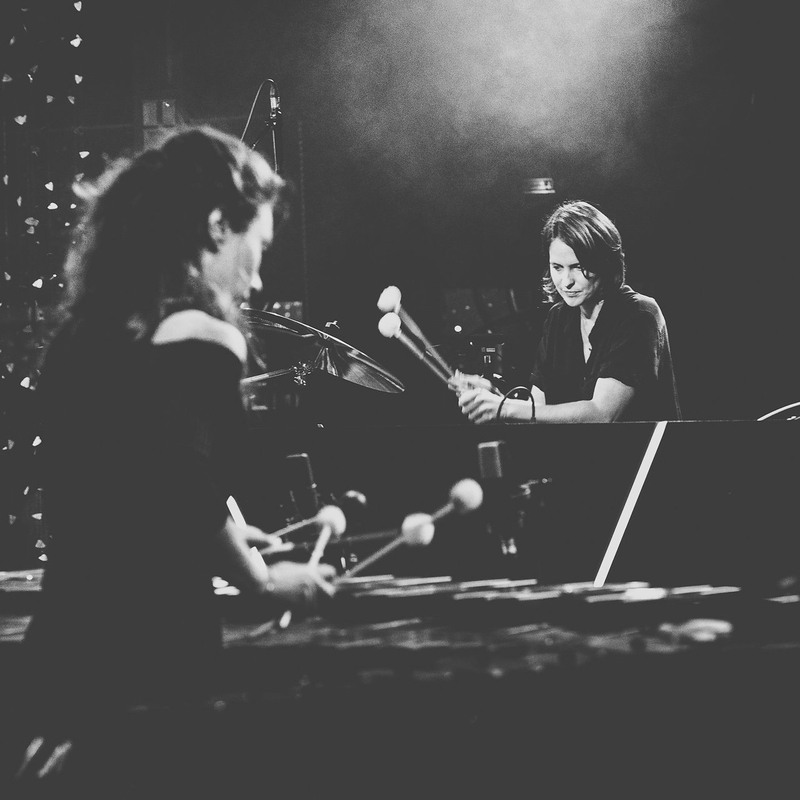 The marimba’s combined rhythmic and aerial character, and its alliance with beats and programming recall works such as the Cliff Martinez’s soundtrack for Soderbergh’s remake of Solaris, Pantha du Prince’s productions, or recent electronic albums like Simian Mobile Disco’s 2018Murmurations. “The marimba the keyboard percussion instrument which offers the most possibilities with its five octaves. Compared to the vibraphone, the sound of the wood attracts me more than the sound of metal: it is warmer, more organic, it allows a great expressiveness” explains Vassilena.